We have become quite adept at using the trains in Sri Lanka. 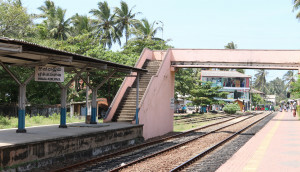 We were feeling very pleased with ourselves as we booked our 2nd class tickets for the 100km trip from Hikkaduwa to Mount Lavinia – tickets only cost 160 rupees each (about 90p) even though we splashed out on 2nd class in the hope of getting a seat. However, when the train arrived it was clear that we might as well have bought 3rd class. The train was so full that we only just got on. Sophie was sitting on the door step (door being wide-open) and John was standing in the doorway trying to stop our big suitcase from knocking Sophie off the train when it lurched… And this was how we travelled for 1.5 hours!? That sounds pretty grim – it was very hot and sweaty – but it was a spectacular ride since the railway follows the coast almost all the way and so we regularly faced crashing waves and a cooling sea breeze. All these journeys remind us that our stay in Sri Lanka is almost over. Emily and the girls fly home on Thursday as John leaves for Chennai. We are so grateful to God for his provision while we’ve been here. Very generous friends have looked after us and Gunadasa, Chandra and Ravi have cared for our every need at Zion Inn. John is speaking at devotions for Navjaveena Hospital tomorrow morning and then we have a special final meal to finish off our stay… The next post will be, God willing, from India. I write this now from Colombo airport. Following the crash in Dubai yesterday the girls’ plane has been delayed. This then made them miss their connection in Dubai and so they are waiting to hear what flight they will be on. Steward: And you are flying with Sri Lankan airlines Sir? So, now it is 12pm and I’ve been at the airport for 6 hours. I’m waiting at gate 8 with all the other passengers who have gone through 3 security checks waiting for boarding to start. At this point the stewards at the gate suddenly say, without any apology, that (due to technical problems) we now to go to gate 4. No directions, no explanations, simply ‘leave this gate’. Eventually it becomes clear that the gate is actually B4, which is downstairs and is joined with 4 other gates. This also means that we have to join a huge queue to go through security again. And this gate does not have a/c. Ummh, again. Something tells me that South Asia is (trying) to teach us patience.